In optical storage, constant linear velocity (CLV) is a qualifier for the rated speed of an optical disc drive, and may also be applied to the writing speed of recordable discs. CLV implies that the angular velocity (i.e. rpm) varies during an operation, as contrasted with CAV modes. The concept of constant linear velocity was patented in 1886 by phonograph pioneers Chichester Bell and Charles Tainter. Laserdiscs, the first consumer optical discs, used constant linear velocity to double playback time (CLV / "extended play" discs can hold 1 hour per side; CAV / "standard play" discs can only hold 30 minutes). As the motor's speed decreases from 1,800 to 600 rpm when the read head moves away from the center (which is the start of the recording), the disc constantly moves past the read head at a constant speed. Later optical formats such as the audio CD also employ CLV to maintain both a constant data rate and a constant bit density. Their rotation gradually decreases from 495 to 212 rpm to keep the disc moving past the read laser at 1.2 m/s (3.9 ft/s). To accommodate the higher data transfer rates and random access requirements of modern CD-ROM drives, CAV systems are used. This is because seek performance would be greatly affected during random access by the requirement to continually modulate the disc's rotation speed to be appropriate for the read head's position. Zoned Constant Linear Velocity (ZCLV) is a modification of CLV for high speed CD and DVD recorders. Early model recorders were CLV drives. The recording speed on such drives was rated in multiples of 150 KiB/s; a 4X drive, for instance, would write steadily at around 600 KiB/s. The transfer rate was kept constant by having the spindle motor in the drive vary in speed and run about 2.5 times as fast when recording at the inner rim of the disc as on the outer rim. 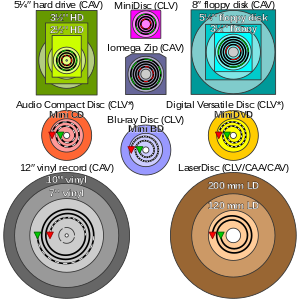 Some high-speed recorders use the zoned CLV method (ZCLV), which divides the disc into stepped zones, each of which has its own constant linear velocity. At higher speeds, ZCLV offers a compromise between CAV, which enables faster seek times, and CLV, which enables greater storage capacity. A ZCLV recorder rated at "52X", for example, would write at 20X on the innermost zone and then progressively step up to 52X at the outer rim. Constant Angular Acceleration (CAA) is a variant of CLV that is used on the Laserdisc format. The initial specification of CLV (as it applies to laserdisc) results in several playback artifacts to be present in the audio/video portion as well as compatibility problems with Laserdisc players as produced by different manufacturers. In the mid 1980s, Pioneer Electronics introduced the CAA scheme where the speed in rotation of the Laserdisc was lowered in steps and eliminated most playback artifacts and compatibility problems. Since its introduction, most manufacturers of Laserdiscs adopted the CAA format but still referred to their CAA-encoded product as CLV.